Hurty Art Market Fact #4: Contrary to popular belief, art does not always go up in value. Prompted by a comment left by Megan (another Megan – not ‘Meaghan’ me – too many Meaghans spoil the broth) on an earlier post, I decided to undertake a little exercise to test whether her very generous assessment of my prophetic skills was on the money, so to speak. Because, as much as I’m delighted to accept random and baseless compliments, I do like to test whether said flattery is justified. One of the many things I looked at in my PhD was repeat sales of artworks at auction, to determine price movements for particular artists. It was fun. What can I say? I have a strange attraction to Excel spreadsheets and formulae – something my year 12 mathematics teacher would likely find surprising. Nowadays, I still keep a close eye on the things that pass through auction in Australia, and my ongoing research interest is in tracking and documenting the crazy alchemy that turns art into money. One of my conclusions is that there is absolutely no guarantee that a work of art bought at auction will rise in value, and sudden and rather dramatic drops in price are not at all uncommon. In the case of an artwork acquired from a commercial gallery, the likelihood of it increasing in value is minute. But back to Megan’s assessment. I decided it was high time I revisited some of my old friends – artists whose prices skyrocketed during the art market boom that ran from 1998/9 to 2007. Below is a chart that shows a few repeat sales of the same artworks by some of the boom’s biggest hitters. 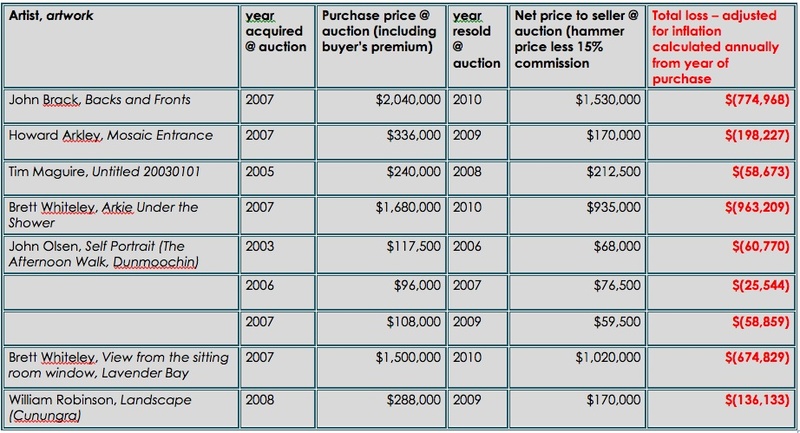 To explain the figures – I started with the hammer price plus premium, which is presumably the total price paid by a buyer to the auction house for that painting. Then, I adjusted that amount, compounding annually, to account for inflation, working out the adjusted value of the original purchase price for the year in which the painting next appeared at auction. Next, I estimated the net amount that went to the seller at the second auction appearance. This amount is the hammer price, less an estimated 15% seller’s commission. I then worked out the difference between the adjusted purchase price and the net amount that went to the seller. Using the first example from the chart to explain this further, somebody paid a total of $2,040,000 for Brack’s Backs and Fronts in 2007. When that person sold it in 2010, they netted $1,530,000. Once you take into account the effect of inflation on the 2007 purchase price, this amounts to an adjusted, real loss of $774,968. Ouch. 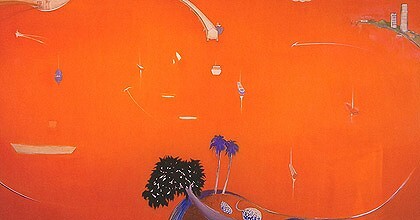 In the case of the John Olsen painting, The Afternoon Walk, it was resold three times between 2003 and 2009, registering a significant loss each time. Ouch, ouch, ouch. Oh, all these sales took place at one or more of the Menzies branches. Yes, we are in the midst of a global financial maelstrom. Yes, under those conditions we would expect to see the value of many investments fall, particularly those that were acquired at the height of the boom. Still… Ouch!